Later, Leopard comes out from the grass. He walks on the hole and falls into it. Anansi spins a giant spider web. “Let me help you!”Anansi shouts down the hole. “Ah, thank you!” says Leopard. 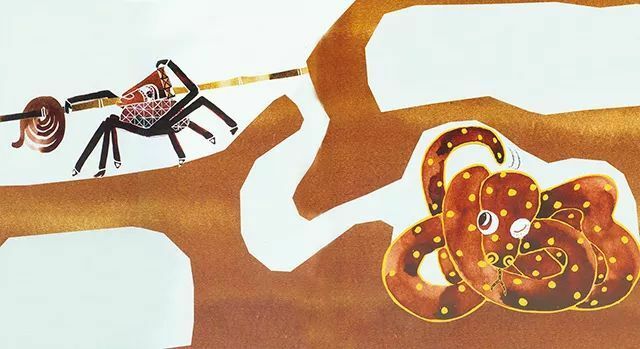 Anansi pulls Leopard out of the hole. He gets tangled in the web. Anansi takes him to Nyame. On the third day, Anansi goes to catch Snake. He brings a long bamboopole and some rope. He stands outside Snake’s home. “Longer and stronger or shorter and weaker?Which is it?Which is it?” he says over and over again. “Hey!” Snake says to Anansi. ‘Are you longer and stronger than this bamboo pole?Or shorter and weaker?’” says Anansi. “That’s easy, I am longer and stronger,” says Snake.